Power is supplied to the MCBTMPM360 Board on your PC using a standard USB connector. 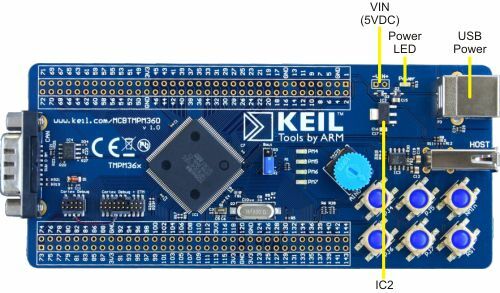 You may also power the board from a bench supply using the VIN connections on the board. The silkscreen labels for the VIN pin connections on the MCBTMPM360 board are reversed. The "+" connection should be labelled "-", and the "-" connection should be labelled "+". In case of a reversed connection, on-board diodes protect the MCBTMPM360 board from damage. The voltage regulator (IC2) generates 3.3 Volts DC.